Six activists were arrested after police opened fire into a crowd of 50 people gathered in Biak a flag-raising ceremony in commemoration of 1 May. Police have reportedly attempted to fabricate evidence consisting of bullets and home-made bombs. On 1 May 2013, Oktovianus Warnares, Yoseph Arwakon, Yohanes Boseren, Markus Sawias, George Syors Simyapen and Jantje Wamaer were arrested in Biak after police opened fire into a crowd of 50 people gathered for a flag-raising ceremony in commemoration of 1 May. Reports indicate that at least two people were hurt, including Jantje Wamaer who was shot in the knee. The six men reportedly face charges of treason under Article 106 of the Indonesian Criminal Code and possession of ammunitions and explosives under Aricles 1, 53, 55 and 56 of the Emergency Law 12/1951. Oktovianus Warnares was reportedly leading the flag-raising ceremony. Local activists claim that incriminating evidence was planted by Biak Numfor police during the course of the two-month investigation period. Among the items reportedly used as evidence against the six activists are 49 bullets and three cartons of home-made bombs. Human rights lawyers reported that Yohanes Borseren, who was beaten heavily on arrest, is currently showing signs of mental illness. 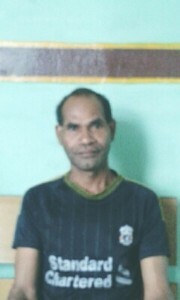 After several months without legal representation, the six men received legal support from Jayapura-based human rights lawyers. Financial difficulties had previously hindered their ability to obtain lawyers – most of the six activists are farmers and cannot afford legal costs. On 13 January 2014, the prosecution demanded an 18-year prison sentence for Oktovianus Warnares. A 15-year prison sentence was requested for George Simyapen, Jantje Wamaer and Yoseph Arwakon, as well as Markus Sawias. The trial of Yohanes Boseren was suspended due to mental health issues brought on by heavy beatings at the time of his arrest. Jantje Wamaer, who was previously sentenced to two years’ imprisonment by the Biak District Court, was late given an increased sentence of 2.5 years’ imprisonment by the Biak High Court. On 1 October 2015, Jantje Wamaer was released from Biak prison.